The 3 projects in the above picture are what you will be making for this class. Payment is no later than Friday 2nd March please, on booking I will forward my bank details. Product Base Classes will need to be paid 2 weeks prior to class date so I have time to put the orders through, they are Non Refundable so if you find you are not able to make the morning or evening class you can either pick it up or I will mail it to you. 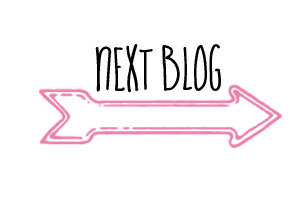 (be sure to sign up to my Newsletter on the left hand side of the Home page) I will also have details on Facebook and my blog here. 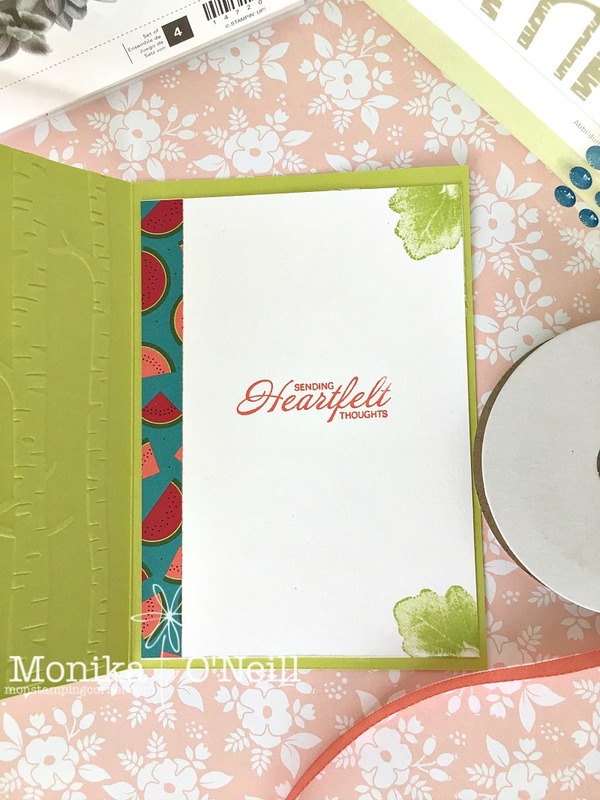 Tuesday March 13th Product Base Class I have chosen the Tutti Fruitti suite. Option A inclusions are: The stamp set Bundle, 4 Classic Stampin Ink spots, 12 sheets of double sided DSP 6x6, 2 of each colour card stock total of 8- Thick Whisper White, Real Red, Daffodil Delight and Lemon Lime Twist, 2mtrs of Lemon Lime Twist mini striped ribbon, Snail adhesive or Liquid tombow (your choice) and a bonus from me a packet of mini dimensional and 15 of each 5 colours of self adhesive sequins. 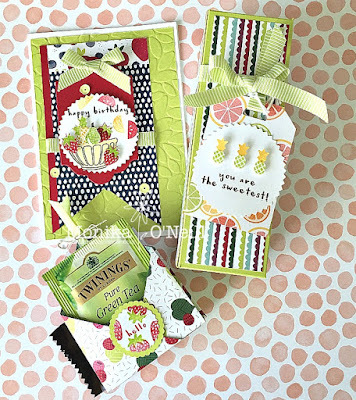 Option B Bundle only - Stamp Set with 4 mini punches, you will receive a bonus of a sheet of mini dimensionals and 10 each of the 5 colour adhesive sequins. Spend an extra $25.00 on any item you will also qualify for a free Sale-a-bration item. You will then receive a full pack mini dimensionals and 15 of each colour sequins. 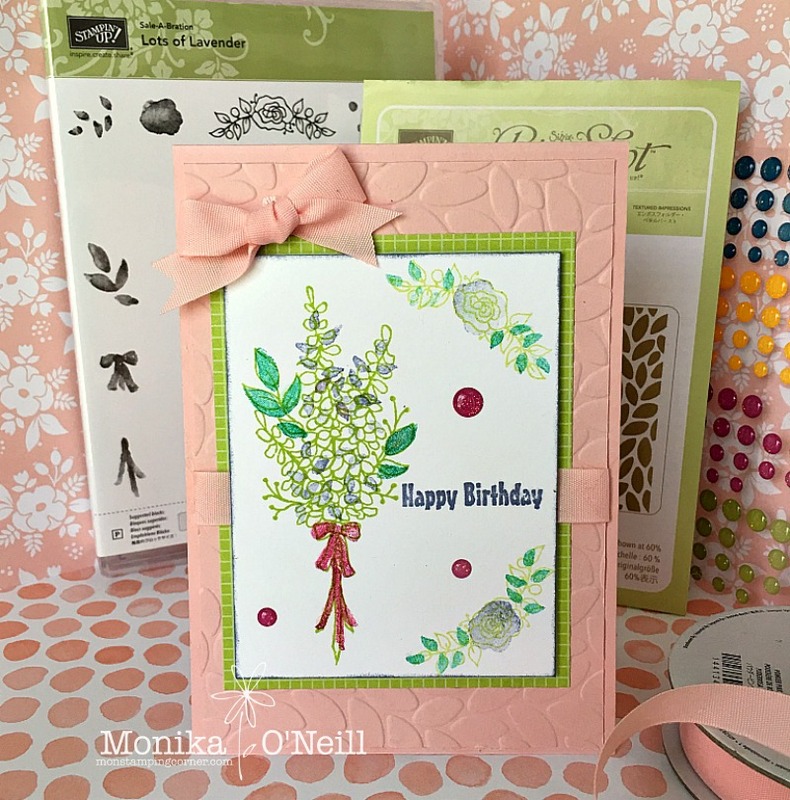 For my first card I used the Heartfelt Blooms stamp set. The card base is Lemon Lime Twist, and I ran the front of the card through the big shot using the Woodlands textured folder, I used a sheet of Tutti Fruity watermelon DSP, and I used the second large framelit from Lots of Labels, and the next size down using Whisper White and stamped the large bloom using Real Red ink. Thinking of you sentiment is stamped in Calypso Coral and I used the second smallest framelit to cut it out and one in calypso coral cardstock and cut it in half and glued one on each edge. The ribbon is Calypso Coral Shimmer ribbon on page 9, I love this ribbon its so pretty and I think I have about 2inches on the roll left. To finish of the card I used wink of stella and some glitter enamel dots. I added a strip of watermelon DSP on the inside for a bit of interest. For my second card I used Blushing Bride for the card base and mat, the Layered Leaves embossing folder was used for the 1st mat, Tutti Fruity DSP for my 2nd mat and whisper white for my 3rd mat which I stamped using Lots of Lavender stamp set, this was the first time I used this set and it was so much fun, its great that you don't have to be perfect in lining anything up. 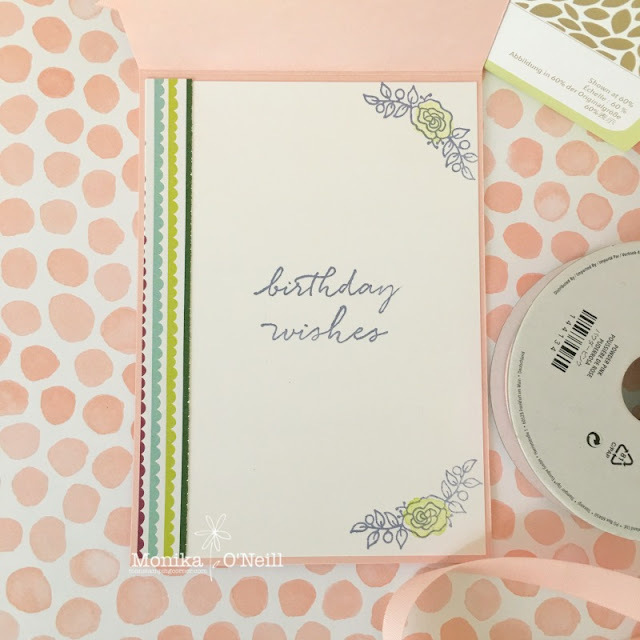 Ribbon is Powder Pink and I also used glitter enamel dots. I also added a strip of DSP on the side and a bit more stamping.